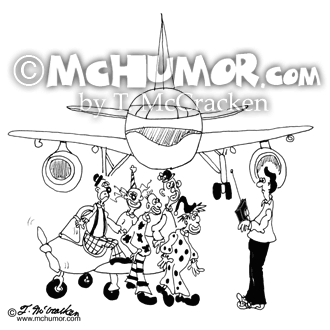 Clown Cartoon 5778: Lots of clowns at an airport climb out of a model airplane. 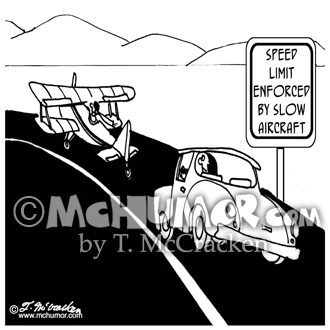 Driving Cartoon 5933: A road sign, "Speed Limit Enforced by Slow Aircraft." A car drives behind a plane that is slowly driving down the road. 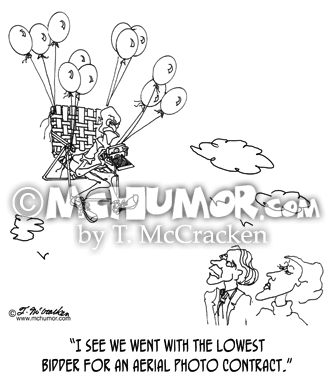 Airplane Cartoon 3452: A plane bounces down a runway on springs. 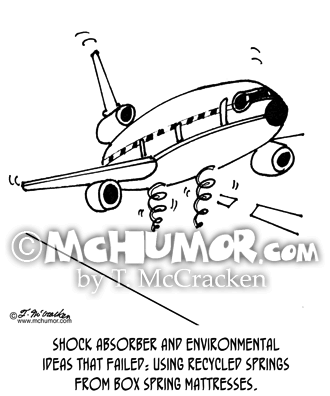 "Shock Absorber and Environmental Ideas that Failed: Recycled Springs from Box Spring Mattresses." 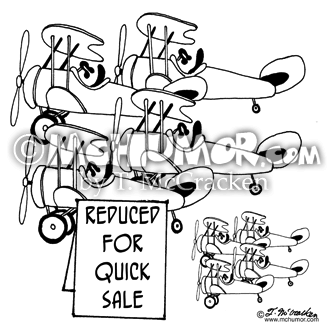 Airplane Cartoon 5137: Next to regular size airplanes are VERY tiny ones with a sign, "Reduced for Quick Sale." 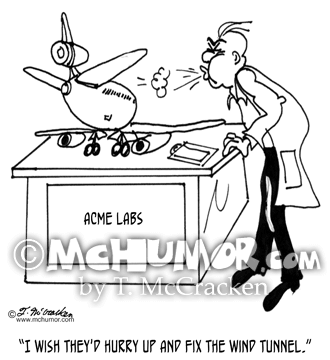 Airplane Cartoon 9210: A researcher blows on a model of an airplane says, "I wish they'd hurry up and fix the wind tunnel." 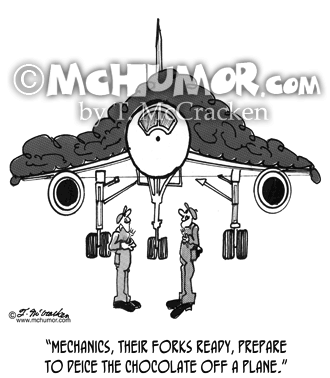 Flying Cartoon 1805: "Mechanics, their forks ready, prepare to deice the chocolate off a plane." An airplane is covered in chocolate frosting. 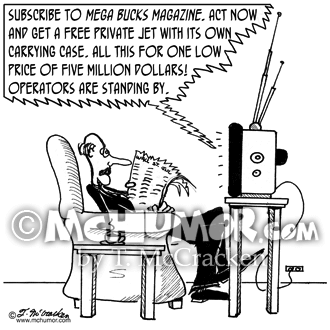 Advertising Cartoon 2133: A man listens to a TV ad, "Subscribe to Mega Bucks Magazine. Act now and get a free private jet with its own carrying case. All this for one low price of five million dollars. 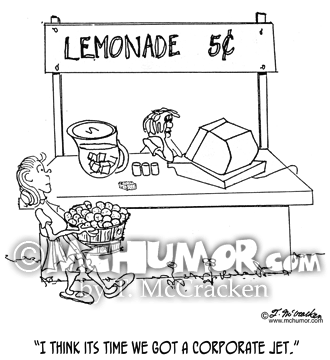 Operators are standing by." 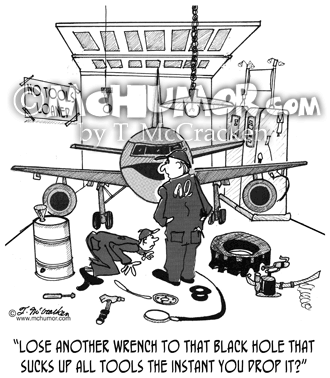 Please Wait To Be Seated, A book with aviation cartoons drawn by 30 cartoonist from around the world.